Business North Carolina - On a sunny, blue-skied fall day, Mike Harrell of Beacon Partners stands on the eighth floor of The RailYard South-end, a 330,000-square-foot mixed-use project under construction that he is overseeing. With a wave of his arm, he points and names other office buildings in the area: Southborough, 1616 Center, Park Avenue, the Boxer Building, Cedar Hill, Dunavant Corners and the Fowler Building, all owned by Beacon. The RailYard, its newest project, is designed to have an older warehouse feel, built out of red and black brick and displaying steel beams and high ceilings. There are arches mimicking those seen on railway roundhouses, floor-to-ceiling glass and an outdoor plaza. Plans call for retail shops and restaurants and 400-square-foot micro apartments to be built on-site. It is the biggest office project to date for Beacon, one of North Carolina’s most active developers and a big beneficiary in the soaring demand for office space in more dense, less suburban neighborhoods. The company often builds speculatively, meaning there are no guaranteed tenants, but its leaders believe in doing homework and intimately knowing their markets. 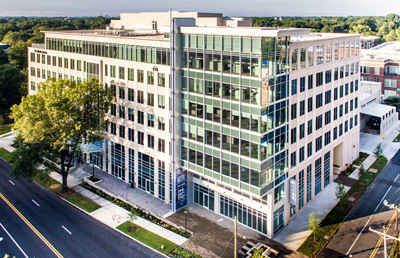 The strategy paid off this summer with the $88.5 million sale of Beacon’s 500 East Morehead office building about 18 months after it opened in Charlotte’s Dilworth neighborhood. New York-based Zurich Alternative Asset Management paid nearly $500 per square foot, one of the highest multiples in Charlotte’s history, according to the HHF Inc. commercial real-estate company. Beacon’s highest-profile project is The RailYard, a South End development that includes two eight-story office buildings and 30,000 square feet of retail space. Consultant EY has leased 30,000 square feet at the project, which is expected to open in early 2019. The RailYard is also a testament to the vision and staying power of the two men who started the company three decades ago with a simple goal of “owning buildings.” There have been bumps along the way thanks to the Great Recession and considerable fine-tuning of focus over the years. But Beacon hasn’t wavered. Lash and Ed Weisiger Jr., scion of a prominent Charlotte family, founded Beacon nearly 30 years ago after working together in commercial real estate in Raleigh. Since that time, Beacon has steadily grown its portfolio of office and industrial buildings and is among the first to bring new, midrise office space to South End. The neighborhood adjoining downtown Charlotte has become an apartment and craft-brewery hot spot, with more than 75% of its 9,000-plus residents under 35, according to the Historic South End booster group. Last year, Beacon was the sixth-largest commercial real-estate developer in the region, ranked by local square feet developed in 2017, according to Charlotte Business Journal. In 1989, Weisiger bought a piece of land in north Charlotte, and Lash visited for a look. He spent one day in town meeting with Weisiger’s family, who own Caterpillar franchisee Carolina Tractor & Equipment Co., and quickly realized Charlotte and the Southeast offered opportunity. With a handshake, a good gut feeling and “without a lot of research, not a lot of thought,” Lash and Weisiger agreed to work together. The two men set up an office in 1989 in an old home on the land Weisiger had acquired. It has since been developed into Northwoods Business Park about 10 miles north of downtown Charlotte. Despite having the backing of the Weisigers, Beacon had no reputation and no credibility as a real-estate buyer. It was the end of a recession. Capital was hard to find and more expensive for Beacon than for its bigger competitors that relied on institutional investors or borrowed at lower interest rates. Lash spent a few years earning fees by helping find tenants for the business park and overseeing small build-to-suit projects for various investors. In 1993, Beacon developed its first multitenant speculative building. Big buildings were out of Beacon’s grasp, so the company focused on smaller structures that could be more easily sold to end users, generating fees and freeing up capital to do more deals. Throughout the early- and mid-1990s, Beacon took on all sorts of industrial projects in different cities. During this time, Harrell and Jon Morris joined Beacon as leasing agents fresh out of Davidson College. When the Great Recession arrived, the company, which had bank loans, found itself struggling with the rest of the real-estate industry. Beacon was lucky in that it sold a big portfolio of industrial and office properties in 2006 and some more in 2008 and 2009 before the worst of the recession. But Beacon also owned several buildings that Lash didn’t want to sell in the downturn, turning them into longer-term holdings. In response, the company’s leasing agents cold-called many prospective tenants. Beacon’s principals recapitalized the loans and found money where they could, including digging into their own pockets. Over the last decade, they have paid back their lenders and investors in full. Morris says Lash carried 3-by-5-inch notecards with details such as square footage or number of tenants written in pencil. The men measured spaces by counting their steps, talked to tenants and noted details such as whether the parking lot was empty or full. “It’s about knowing your customer,” Morris says. Beacon made its first big acquisition in 2002, when the company got a tip from a broker that the Atando Business Park in north Charlotte was up for sale. The company put together its first offering memorandum and raised $4 million from investors to buy the 1-million-square-foot park, which the C.D. Spangler Jr. family had owned for many decades. “Atando was a game changer for us,” Lash says of the site, which Beacon still owns. The company decided to focus on acquiring buildings and expanding its industrial holdings into other cities in the Carolinas. Then, in the late 2000s, Beacon sold off its suburban office properties and by 2011 had decided to focus on buying and building urban-infill office buildings near downtown Charlotte. “It was a big change from being a career suburban office developer for eight or 10 years, to getting rid of it all and packing up to midtown,” Lash says. In 2015, Beacon acquired six buildings on or near Morehead Street that brothers Henry and Averill Harkey had assembled over the previous 30 years. The combined properties had about 500,000 square feet of office space in the Dilworth and SouthPark areas. Completed in early 2017, Beacon’s 500 East Morehead building was acquired for $88.5 million, or nearly $500 per square foot, in August. The buyer was a unit of Zurich Insurance AG. Tenants include McDermott International and Elliott Davis PLLC. There have been missed opportunities. The company could have joined in the multifamily building craze, but Lash said no. “I stubbornly said we would stick to what we knew,” he says. Over the last eight years, more than 40,000 apartment units have been built in Mecklenburg County, with another 25,000 planned or under construction. 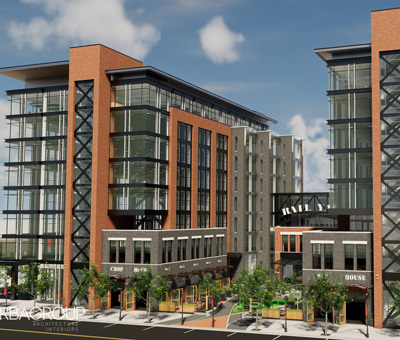 In South End, Harrell has preleased 75% of The RailYard. A 1,000-foot terrace sits at the building’s top, and there’s an exterior stairway designed to encourage workers’ interactions with the street scene. Epitomizing the building’s appeal to the younger generation of workers, WeWork, the New York-based company that is the leading lessor of coworking property, has signed a lease for 44,000 square feet.